The Quimby Barn became the home of the Sandwich Historical Society Transportation Museum in 1991. For more information on the history of the Quimby Barn Click Here or its recent renovations Click here. This Concord coach, owned by the Town of Sandwich, was built in 1850 per order of Curtis S. Coe for the Senter House in Center Harbor (the hotel, on the site of the Nichols Memorial Library, burned in 1887). L. Downing and Sons in Concord, NH built the coach, which was known as Concord Coach No. XVI, a nine passenger, city-style, wooden boot, mail coach. Major Lewis Downing visited Center Harbor in 1900 to inspect the "Senter House Coach" in its 50th year, declaring "with a few general repairs it will stand the racket for many years to come..."
The coach was owned in 1914 by Dennison R. Slade, a Sandwich Squam Lake gentleman farmer, who offered it to Center Harbor by warrant article XXIII, "to be properly housed and kept as an old relic of the town." The article was tabled and the coach given to Sandwich before D. R. Slade's death on June 17,1914. The Sandwich Reporter on October 7 and 21, 1915 reported that at the Sandwich Grange Fair Parade "the old stage coach... decorated, drew its share of attention and applause, winning first prize. It was a striking feature in the parade." For much of the 1920s and 30s, the coach was featured at a small museum at Robert's Pinnacle Park Zoo until the 1938 hurricane "did it all in". On September 22, 1939 "We hauled back to Sandwich....the old stage coach..." and it was in the 1939 Sandwich Fair parade. A decision to repair the coach which was in sad shape, was made after the 1939 Fair, with a goal of being featured in the 1941 parade. Edwin G. Burgum, son of a decorator of Concord Coaches, oversaw the restoration. The Sandwich Town and Grange Fair Association paid the cost. 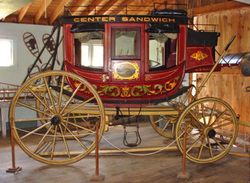 The Sandwich Concord Coach is featured every year in the Sandwich Fair Parade. 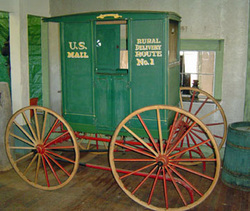 This mail wagon was driven by the rural mail carriers in Sandwich. Elmer Thompson (1868-1944) had been a mail carrier for many years and most probably used this wagon as did his son, Guy Thompson (1890-1957), who took over the route in December, 1932. Lena Thompson Nelson (1905-1994) substituted for her brother, Guy, and more than likely drove this wagon before the rural carriers turned to automobiles. Chaise - Also known as a "one horse shay", this vehicle has an ingenious suspension system, which accounts for its popularity in its time. The body is suspended on leather straps, called thoroughbraces, and the seat is mounted on wooden cantilevered springs, making for its comfortable ride. The weight of the occupants is over the axle, making the vehicle well-balanced and easy on the horse. It is also known as a Boston Chaise or New England Chaise. Concord Express Wagon - This wagon was on the front lawn of the Elliott Homestead in Whiteface Interval for many years, after decades of use by the Elliott's. Floyd Hackett of Laconia restored it from 1981-84 and donated it to the Sandwich Historical Society. This wagon was one of the many styles made by the Abbott and Downing Company in Concord. Summer Hearse - Similar to the winter hearse in this collection, funeral director Henry N. Clay also used this hearse for many years in the Sandwich area for burials.